Jules Victor Clairin (1843–1919), Elegant Couple at the Coast (date not known), oil on canvas, 65 x 54 cm, location not known. Wikimedia Commons. Skilled artists, with the aid of trees, smoke, waves, clouds, skies, and some other features of nature, can paint the wind very effectively. Add some people, and this is what happens. Katsushika Hokusai (葛飾北斎) (1760–1849),『駿州江尻』(Sunshū Ejiri), Ejiri in Suruga Province (Travellers Caught in a Sudden breeze at Ejiri, A Sudden Gust of Wind) (c 1830), woodblock color print, part of the series Thirty-six Views of Mount Fuji, no. 35. Dimensions and location not known. Wikimedia Commons. 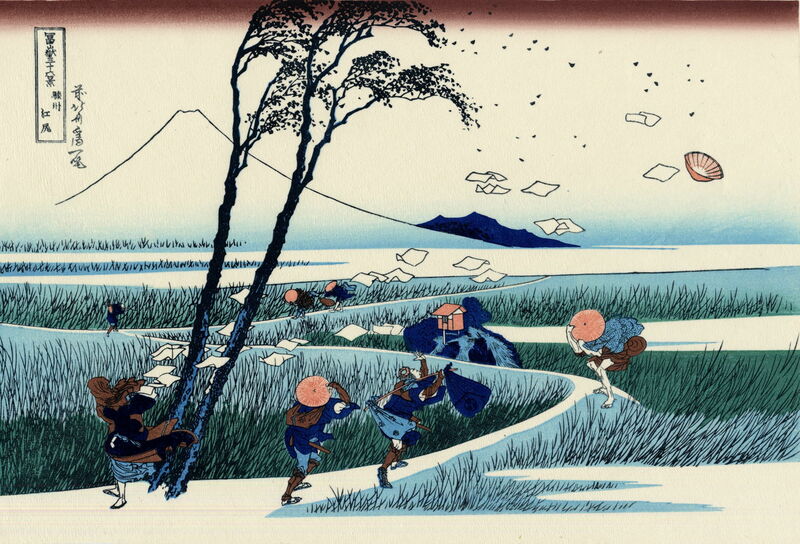 One of the simplest and most effective images of people in the wind is Hokusai’s (葛飾北斎) brilliant woodblock print from about 1830 of『駿州江尻』(Sunshū Ejiri), Ejiri in Suruga Province, also known as Travellers Caught in a Sudden breeze at Ejiri or A Sudden Gust of Wind. On their own, the trees and grass couldn’t have the same visual impact as blown hats, clothing, and most of all the papertrail reaching high up into the sky. Eastman Johnson (1824–1906), The Girl I Left Behind Me (1870-75), oil on canvas, 106.7 x 88.6 cm, Smithsonian American Art Museum, Washington, DC. Wikimedia Commons. 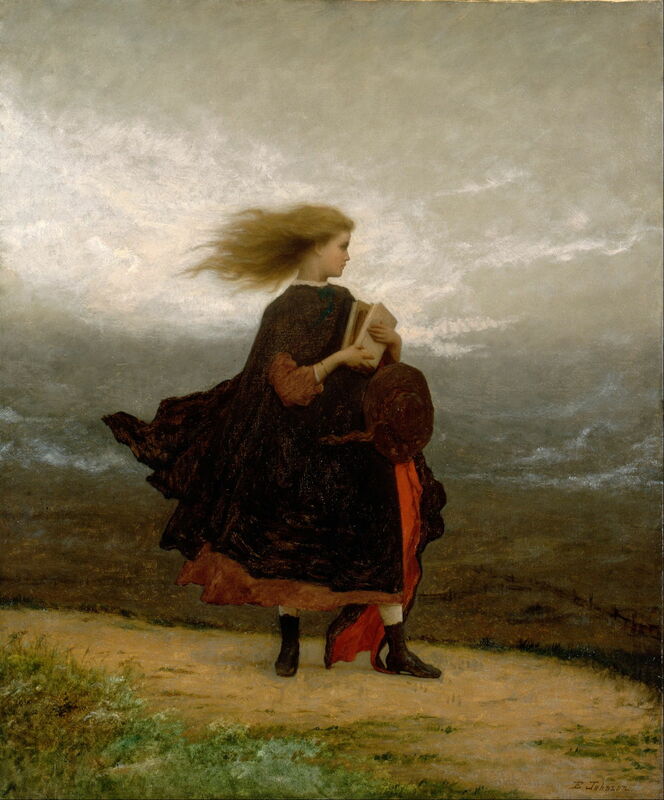 Eastman Johnson’s The Girl I Left Behind Me (1870-75) uses the most common devices of hair and clothing to place its single figure in a strong breeze, but this works best if they look into the wind. 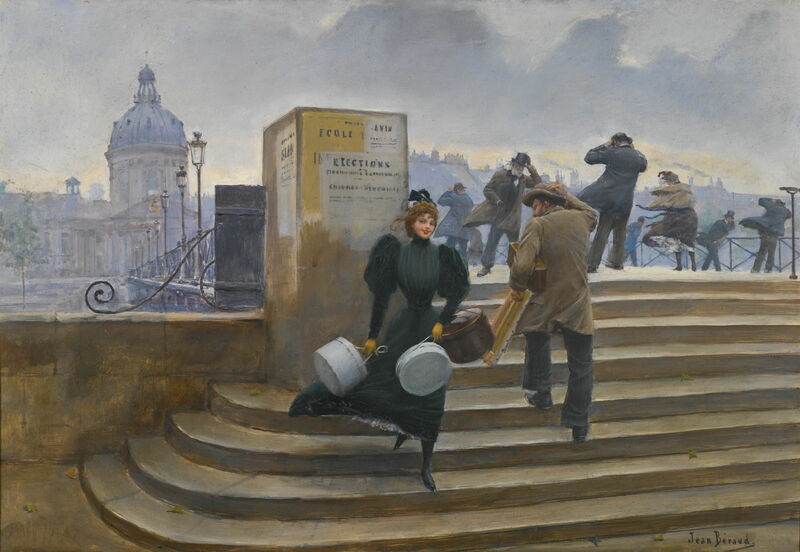 Jean Béraud, in his A Windy Day on the Pont des Arts (1880-1) above, and Milliner on the Pont des Arts (1879-82) below, accomplishes the effect using clothing, particularly hats, and objects being carried. These are two of a series of at least four paintings which Béraud made of this bridge in similar conditions. He also leans several of his figures into the wind to enhance the effect. In the painting below, the other foreground figure is carrying a canvas and paint box, who could be a self-portrait, or perhaps the character Elixir, from Proust’s popular Remembrance of Things Past, a composite of Whistler, Vuillard, Helleu, Béraud himself, and others. 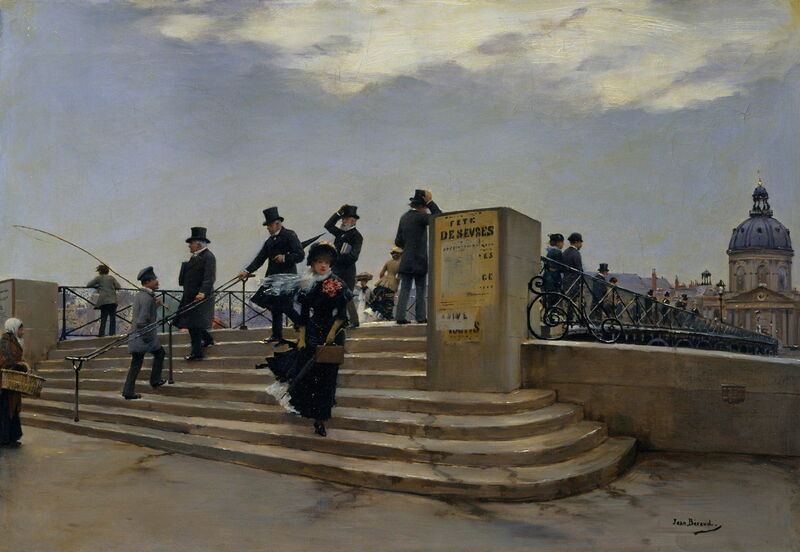 Jean Béraud (1849–1935), Milliner on the Pont des Arts (1879-82), oil on panel, 37.5 × 56 cm, Private collection. Wikimedia Commons. 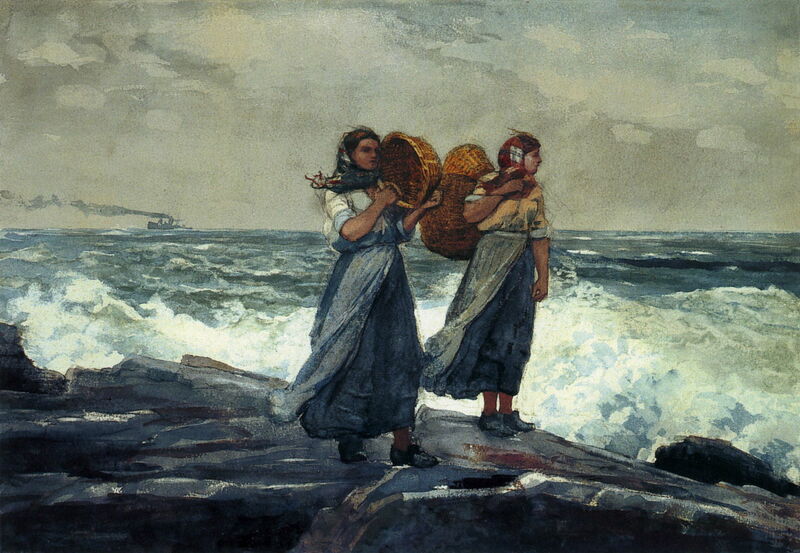 Working at the same time in the coastal village of Cullercoats in the north-east of England was the great American painter Winslow Homer. 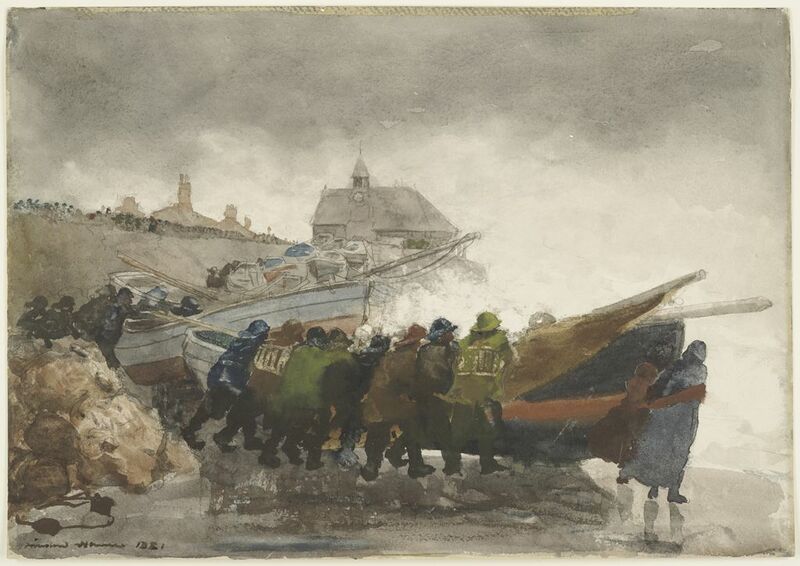 Many of his fisherfolk were seen standing looking out to sea, or busy working, in the wind, and its effects on them are an almost constant feature of his paintings made there. He had the advantage that the signs read from the sea were often more prominent than the more subtle effects on hair and clothing. In the most severe conditions, the storm seas broke so violently that the air became filled with its spray. 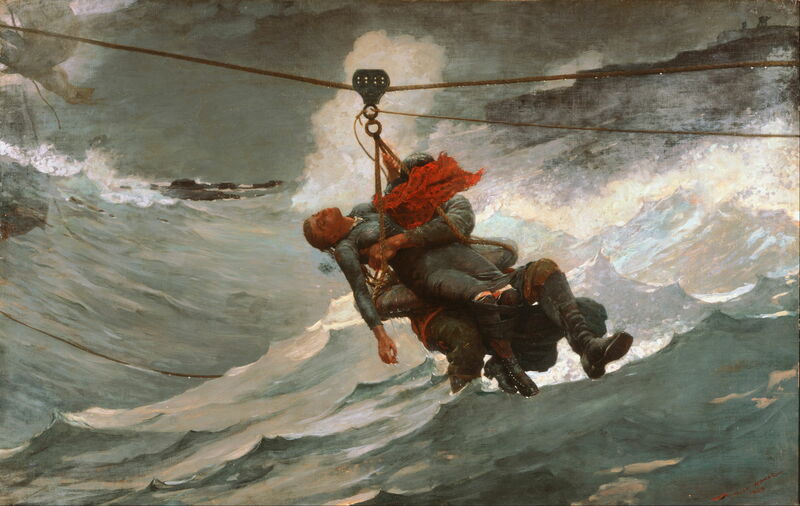 This was a great influence on his later work, after he returned to the USA, in masterpieces such as The Life Line (1884), below. 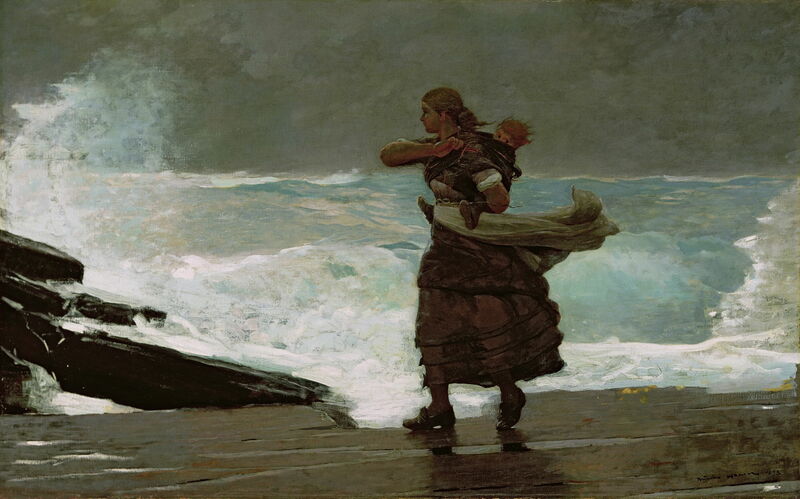 Winslow Homer (1836–1910), The Life Line (1884), oil on canvas, 72.7 × 113.7 cm, Philadelphia Museum of Art, Philadelphia, PA. Wikimedia Commons. This was ostensibly inspired by the rescue of a young woman from shipwreck off Atlantic City, New Jersey, in the summer of 1883, but his victim here still resembles the fishlasses from Cullercoats, complete with her billowing red shawl. 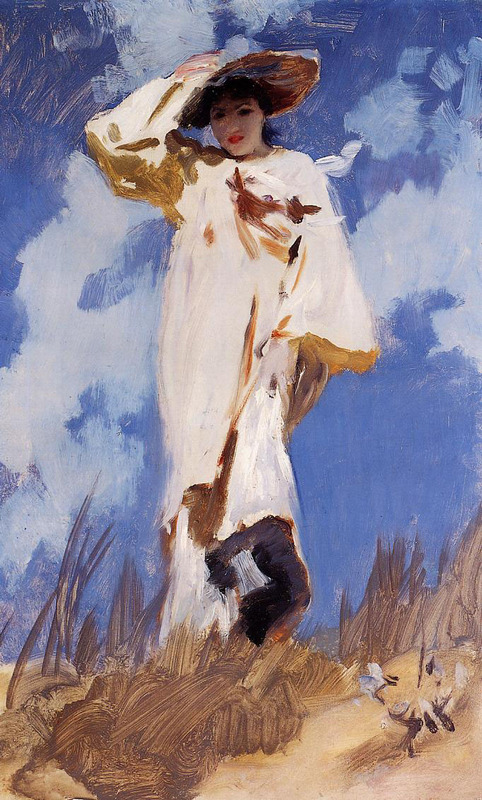 More painterly style is often an advantage when depicting figures in the wind: John Singer Sargent’s virtuoso oil sketch A Gust of Wind (c 1886-7) shows how well that can work with the minimal clues of a hand held to the hat, and a few wisps of clothing blown back. 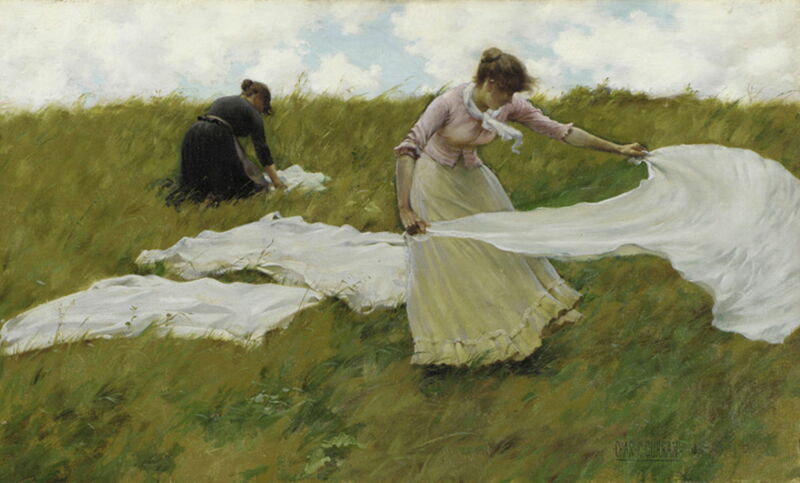 Loose and billowing props such as washing are also useful; here Charles Courtney Curran makes it look A Breezy Day (1887) with their aid. Charles Conder (1868–1909), Hot Wind (1889), oil on cardboard, 29.4 x 75 cm, National Gallery of Australia, Canberra, Australia. Wikimedia Commons. I showed in the previous article how the combination of wind and snow can be made to look bleak with only the most subtle hints from figures. Trying to convince the viewer of searing hot wind without the involvement of figures is far harder. Charles Conder, the Australian Impressionist, succeeds in his Hot Wind (1889), using only simple if unusual objects. He also borrows from the Renaissance device of making visible the thin stream of breath blowing from the woman’s mouth – something which was standard in conjunction with the rounded cheeks of a zephyr or similar. Jules Victor Clairin’s undated Elegant Couple at the Coast comes not from the Rococco, but as indicated by the very painterly style of the slippery rocks, was most probably painted in the early years of the twentieth century. 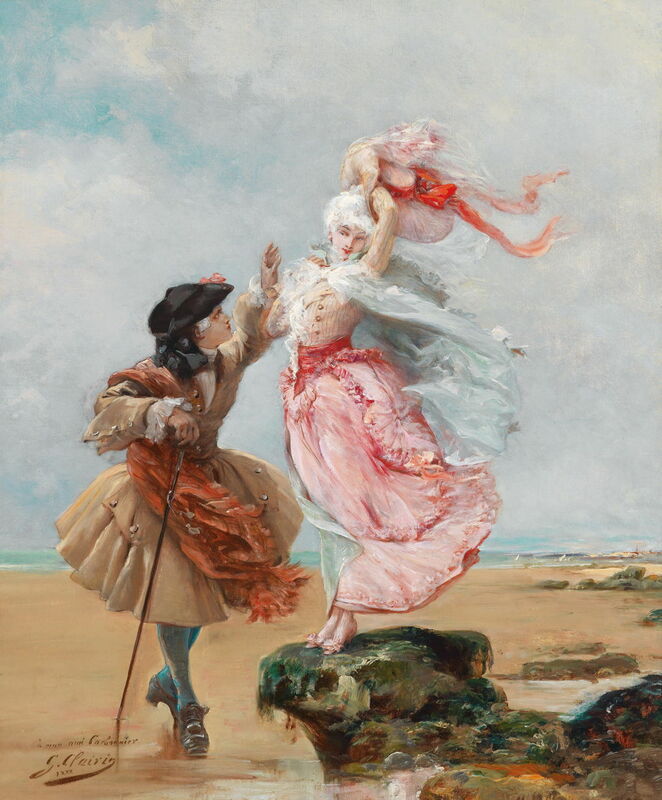 The very pink young ‘galante’ woman is a textbook example of how to make a figure look windswept, although her partner seems mysteriously to be unaffected by the breeze. John William Waterhouse (1849–1917), Windflowers (Windswept) (1903), oil on canvas, 114.3 × 78.7 cm, Private collection. Wikimedia Commons. 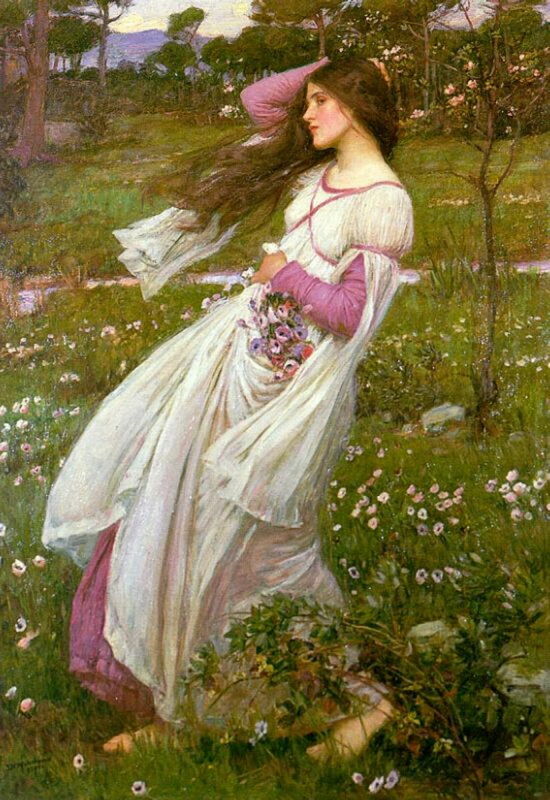 My final example is another carefully-crafted full-length portrait of a woman in long, loose dress: John William Waterhouse’s Windflowers (Windswept) (1903). She may lack a hat, but with the wind behind her needs to hold her long tresses to prevent them from blowing into her eyes and face. Although the landscape around her does not look particularly moved by the wind, she leans back into it, her knees flexed, and ample loose folds of fabric are billowing downstream. Painting the wind is neither futile, nor really that difficult. In the hands and brushwork of a good or even great artist, it’s actually a bit of a breeze. Posted in General, Painting and tagged Béraud, Clairin, Conder, Curran, Hokusai, Homer, Johnson, landscape, painting, Sargent, storm, Waterhouse, Wind. Bookmark the permalink.